Alister Edgar McGrath FRSA (born 1953) is a Northern Irish theologian, priest, intellectual historian, scientist, Christian apologist, and public intellectual. He currently holds the Andreas Idreos Professorship in Science and Religion in the Faculty of Theology and Religion at the University of Oxford, and is Professor of Divinity at Gresham College. He was previously Professor of Theology, Ministry, and Education at King's College London and Head of the Centre for Theology, Religion and Culture, Professor of Historical Theology at the University of Oxford, and was principal of Wycliffe Hall, Oxford, until 2005. He is an Anglican priest. Aside from being a faculty member at Oxford, McGrath has also taught at Cambridge University and is a Teaching Fellow at Regent College. McGrath holds three doctorates from the University of Oxford: a Doctor of Philosophy degree in molecular biophysics, a Doctor of Divinity degree in theology, and a Doctor of Letters degree in intellectual history. McGrath was born on 23 January 1953 in Belfast, Northern Ireland, and grew up in Downpatrick, County Down, where he attended Down High School. In September 1966 he became a pupil at the Methodist College Belfast, where his studies focused on mathematics, physics and chemistry. He went up to Wadham College, Oxford, in 1971 and gained first-class honours in chemistry in 1975. He began research in molecular biophysics in the Oxford University Department of Biochemistry under the supervision of George Radda and was elected to an E.P.A. Cephalosporin Research Studentship at Linacre College, Oxford, for the academic year 1975–1976, and to a Domus Senior Scholarship at Merton College, Oxford, for the period 1976–1978. During these three years, he carried out scientific research while studying for the Oxford University Final Honour School of Theology. He was awarded an Oxford Doctor of Philosophy degree for his research in molecular biophysics (December 1977), and gained first-class honours in theology in June 1978. Reflecting on his time as an undergraduate at Wadham, McGrath has written, "I was discovering that Christianity was far more intellectually robust than I had ever imagined. I had some major rethinking to do, and by the end of November , my decision was made: I turned my back on one faith and embraced another." McGrath then left Oxford to work at the University of Cambridge, where he also studied for ordination in the Church of England. In September 1980, he was ordained deacon and began ministry as a curate at St Leonard's Parish Church, Wollaton, Nottingham, in the English East Midlands. He was ordained priest at Southwell Minster in September 1981. In 1983, he was appointed lecturer in Christian doctrine and ethics at Wycliffe Hall, Oxford, and a member of the Oxford University Faculty of Theology. He was awarded a BD by Oxford in 1983, for research in historical theology. He spent the fall semester of 1990 as the Ezra Squire Tipple Visiting Professor of Historical Theology at the Divinity School of Drew University, Madison, New Jersey. McGrath was elected University Research Lecturer in Theology at Oxford University in 1993 and also served as research professor of theology at Regent College, Vancouver, from 1993 to 1999. In 1995, he was elected Principal of Wycliffe Hall and in 1999 was awarded a personal chair in theology by Oxford University with the title "Professor of Historical Theology". He was awarded the Oxford degree of DD in 2001 for his research in historical and systematic theology, and was a founding member of the International Society for Science and Religion. On 1 September 2008 McGrath took up the Chair of Theology, Ministry and Education in the Department of Education and Professional Studies at King's College London. In 2010 McGrath was included in "The 20 Most Brilliant Christian Professors" list. In 2013 he was awarded his third doctorate from Oxford University, a DLitt, Division of Humanities, for research into science and religion, and natural theology. He is married to Joanna Collicutt McGrath and they have two adult children. ^ a b c "Review Article: Alister E. McGrath's A Scientific Theology" (PDF). Andrews University Seminary Studies. 44 (2): 345. 2006. ISSN 0003-2980. Retrieved 25 February 2019. ^ McMath, Terence Handley (7 July 2017). "Alister McGrath, Theologian". Church Times. London. Retrieved 25 February 2019. ^ McDonald, Jeffrey S. (2017). John Gerstner and the Renewal of Presbyterian and Reformed Evangelicalism in Modern America. Eugene, Oregon: Pickwick Publications. pp. 183–184. ISBN 978-1-4982-9631-1. ^ "Frank A. James III, DPhil, PhD". Hatfield, Pennsylvania: Missio Seminary. Retrieved 25 February 2019. ^ Aitken, Jonathan (2006). Heroes and Contemporaries. London: Continuum. p. 234. ISBN 978-0-8264-7833-7. ^ Why God Won't Go Away: Reflections on the "New Atheism"
^ "Theology and reality: Critical realism in the thought of Alister E. McGrath – Udini". Archived from the original on 25 July 2013. Retrieved 1 July 2012. ^ McGrath, Alister (2010). Mere Theology. London: SPCK. p. 80. ISBN 978-0281062096. ^ McGrath, Alister (2010). Mere Theology. London: SPCK. p. 81. ISBN 978-0281062096. ^ Nigel Bovey. "Alister McGrath talks of God, science and Richard Dawkins". Christian Evidence Society. Retrieved 13 November 2010. All I can say is that, with complete integrity, there are many Christians who see evolution as illuminating the way in which we understand Genesis and as giving us an enhanced vision of how God brought the world and humankind into being. People can make evolution atheistic but it doesn't have to be. ^ Roger Morris. Is 'Theistic Evolution' a Cop-Out?. Faith Interface. Modern proponents of theistic evolution include: Dr Francis Collins, former director of the Human Genome Project and author of The Language of God: A Scientist Presents Evidence for Belief (2007). 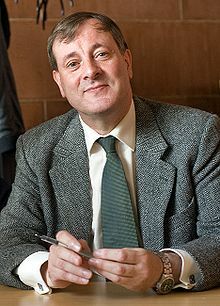 Prof Alister McGrath, former Oxford molecular biophysicist and current Professor of Theology, Ministry and Education, and Head of the Centre for Theology, Religion and Culture at King's College, London. He is the author of numerous books and textbooks on Natural Theology and Scientific Theology. Rev. Dr John Polkinghorne, Physicist and Theologian from Cambridge University. Keating, James F. "The Natural Sciences as an Ancilla Theologiae Nova: Alister E. McGrath's A Scientific Theology." The Thomist 69 (2005): 127–52. Myers, Benjamin. "Alister McGrath's Scientific Theology." Reformed Theological Review 64 (2005): 15–34. Shipway, Brad. "The Theological Application of Bhaskar's Stratified Reality: The Scientific Theology of A. E. McGrath." Journal of Critical Realism 3 (2004): 191–203.